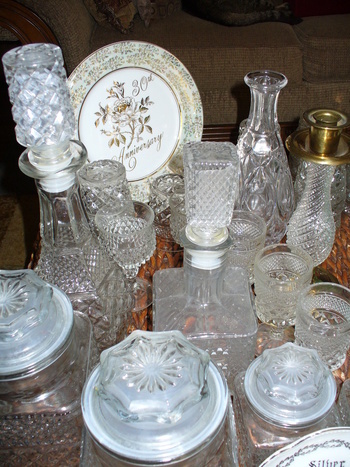 In Glassware > Early American Pattern Glass > Show & Tell. Not sure if this is Fostoria crystal, pattern glass, or a mixture of all. 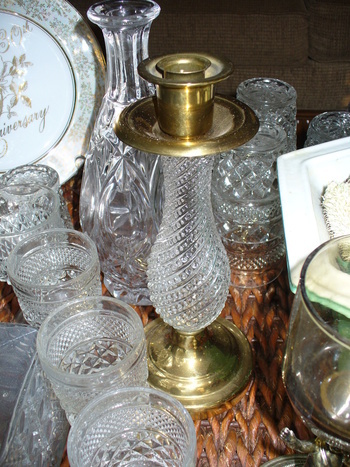 Very pretty stuff I bought in the lot of brass, gold and silver. Great stuff! 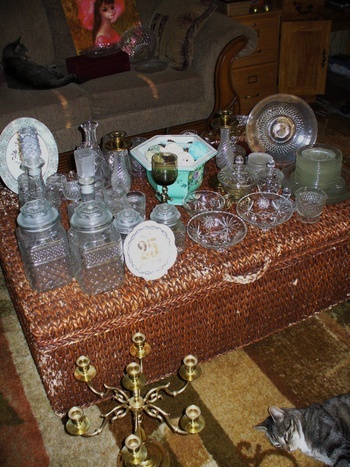 I know the star pattern items in the first picture are from Anchor Hocking, EAPC pieces also known as Star of David. 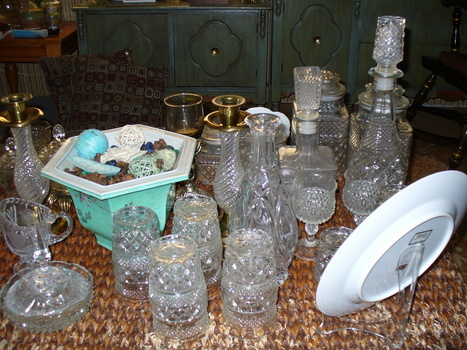 Some of the criss cross pattern items, covered jars, some of the stemmed glasses are the Wexford pattern also from AH. The tall genie like bottle wine carafe is also Wexford although the stopper is not. It sure does! I knew the Star of David pattern, but not much else. That type of crystal is hard for me to identify. I may have the stoppers switched (there are two). Bought this entire lot, along with gold platters, and brass candelabras from a lady last night who was selling her parents' estate items...for 50.00! You got a great deal. It took me a long time to be able to identify some of the patterns. I love going to estate sales, you never know what you will find. BTW, I look forward to your posts. I could look at this kind of glass all day!